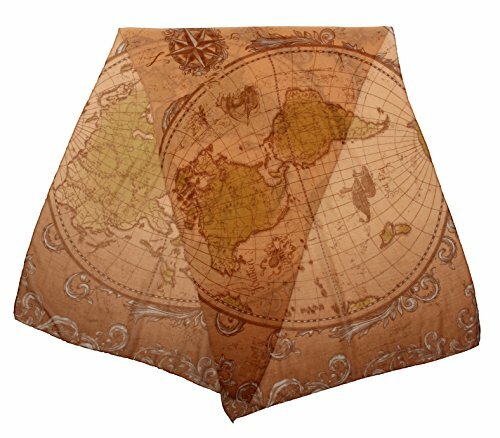 elope Olde World Map Lightweight Scarf for Women by elope at Average Adventures. Hurry! Limited time offer. Offer valid only while supplies last. Fashion and the great wide world collide to form the ultimate traveler's costume experience with this Old World Map Lightweight Scarf by elope. Fashion and the great wide world collide to form the ultimate traveler's costume experience with this Old World Map Lightweight Scarf by elope. Designed for you with love and laughter in Colorado Springs, USA. About elope, Inc. - In 1993, elope's founders created an enterprise dedicated to a vision of happiness: everybody's laughing on planet earth (e.l.o.p.e). Over 20 years later, it's that same joy of adventure, love of discovery, and passion for self-expression in creative costuming that inspires every product decision at elope. elope's mission is to make everybody laugh on planet earth by creating the highest quality whimsical wearables through fantastical service while being a socially responsible business. Our founders’ genuine dedication to increasing the world's happiness expresses itself in costume and cosplay fashion excellence.